When drivers of cars, buses, or trucks cause a motorcycle accident, one of the most common defenses they give to the police officer investigating the crash is “I didn’t see the motorcycle.” While it is true that motorcycles are much smaller than automobiles, this is not a valid excuse for causing a collision. The reality is that failure to see motorcyclists is negligent driving and results in motorcycle riders suffering life-altering injuries, such as traumatic brain injury, fractures, back and spinal injuries, internal organ damage, or death. Failure to watch for motorcycles. Most drivers expect and look for cars and trucks before making a turn, changing lanes, or proceeding through an intersection. However, since motorcycles are not as common as cars, they may fail to even watch for motorcyclists. Failure to check blind spots. 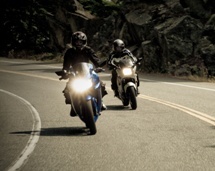 Because motorcycles are smaller than other vehicles, they can more easily be hidden in a larger vehicle’s blind spot. When drivers see a motorcycle rider nearby on the road, they need to pay extra attention to be certain the rider has not moved into their blind spot before taking actions like changing lanes or turning. Engaging in distracted driving. When drivers are eating and drinking, talking on a cellphone, or texting, their eyes and concentration are not on their driving. As a result, it can be easy for them to miss seeing a smaller motorcycle until it is too late. Fatigue. If a driver is fatigued, his driving abilities are impaired, and he may be focused on trying to stay awake rather than looking for a motorcycle rider. Even worse, a fatigued driver could fall asleep at the wheel and collide with a nearby motorcycle. Intoxication. If a driver is intoxicated on drugs or alcohol, his vision, reaction times, and general driving skills are reduced. This makes it much more likely that he would forgot to look for a motorcycle or would only perceive it when there is no time to avoid a wreck. Did the negligent driver who caused your motorcycle accident claim that he did not see you? You need to hold him accountable for compensating you for your injuries. To learn how Andrew Kim Law Firm, PLLC can help you obtain justice, call our office today to schedule a free consultation.